The following is the Boxing Insider notebook for the week of April 10th to April 17th; covering the comings and goings in the sport of boxing that you might have missed. The previously announced 10-round clash between fast-rising, unbeaten knockout artist SHOHJAHON ERGASHEV, (11-0-0, 11 KO’s), a native of Uzbekistan, now fighting out of Brooklyn, NY and China’s ZHIMIN WANG, (10-2-0, 3 KO’s), has now been elevated to a WBA International Junior Welterweight Title bout, it was announced today by Matchroom Boxing USA, promoter of “Straight Outta Brooklyn”,the massive international boxing event set for Saturday, April 28 at Barclays Center in Brooklyn, NY. 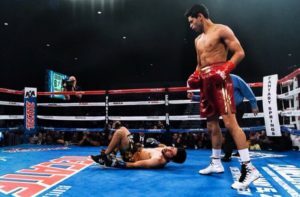 The 26-year-old Ergashev, training out of the famed Kronk Gym in Detroit, has quickly impressed boxing fans in the United States with two recent show-stopping knockouts and 100% knockout ratio, building a huge following in the New York City area. In his U.S. debut, the hard-hitting southpaw stopped Marquis Hawthorne in the second round on November 11, 2017 at NYCB LIVE, home of the Nassau Veterans Memorial Coliseum. Making his nationally televised debut on January 12, 2018 in roaring style, Ergashev knocked out undefeated, highly regarded contender Sonny Fredrickson in the third round in Verona, New York. He is promoted by Salita Promotions. “Shohjahon has all the ingredients to dominate the junior welterweight division and be a star in the ring,” said Dmitriy Salita, President of Salita Promotions. “His work ethic, punching power and desire for greatness is very special. Zhimin Wang is a very skilled, durable fighter and I expect a great fight on April 28. Advance tickets for ‘Straight Outta Brooklyn’starting at $42 may be purchased by visiting Ticketmaster.com, BarclaysCenter.com, or calling 800-745-3000. Tickets for the event can also be purchased at the American Express Box Office at Barclays Center. For information on group sales, call 844.255.9647. Former bantamweight world champion Raushee Warren and top prospect Fabian Maidana will step into the ring at Barclays Center, the home of BROOKLYN BOXING™, on Saturday, April 21 in separate attractions as part of an exciting night of undercard fights. The Premier Boxing Champions event is headlined by four-division champion Adrien Broner battling former welterweight world champion Jessie Vargas. The SHOWTIME telecast begins at 9 p.m. ET/6 p.m. PT and features undefeated former world champion Jermall Charlo clashing with once-beaten Hugo Centeno, Jr. for the interim 160-pound world title and former champions Gervonta “Tank” Davis and Jesus Cuellar as they square off for the vacant WBA 130-pound Super World Championship. Warren (15-2, 4 KOs) will return to action in an eight round bantamweight fight against Juan Medina (10-2, 9 KOs), whileMaidana (14-0, 10 KOs) steps in for a 10-round super lightweight showdown against Hevinson Herrera (22-14-1, 16 KOs). The undercard attractions also include popular local female contender Heather “The Heat” Hardy (20-0, 4 KOs)as she competes in a featherweight contest against Mexico’s Paolo Torres (10-2-1, 3 KOs). The action inside the arena will also feature a pair of 2016 Olympians in separate six-round super lightweight attractions as U.S. Olympian Gary Antuanne Russell (4-0, 4 KOs) enters the ring against Andrew Rodgers (4-2-1, 2 KOs) and Haitian Olympian Richardson Hitchins (4-0, 2 KOs) battles Alexander Charneco (4-4, 4 KOs). Brooklyn’s unbeaten Chordale Booker will step into the ring for a six-round super welterweight fight against Daniel Calzada while the Bronx’s undefeated heavyweight George Arias competes in an eight-round attraction against Tyrell Wright. The action rounds out with unbeaten super featherweight Desmond Jarmon battling Kendrick Latchman in a four-round showdown, unbeaten prospect Shyngyskhan Tazhibay in a four-round welterweight contest against Justin Savi (31-15-2, 21 KOs) and undefeated prospect Dylan Price, who meets Edson Noria for a six-round super flyweight bout. The 31-year-old Warren became a world champion in 2016 when he defeated Juan Carlos Payano to capture the WBA Bantamweight World Championship. The Cincinnati-native represented the U.S. three times at the Olympic games during a prolific amateur career and most recently defeated former champion McJoe Arroyo last July at Barclays Center. He returns to Brooklyn to face the 25-year-old Medina, who fights out of the Dominican Republic. The brother of former welterweight champion Marcos Maidana, Fabian will look to remain unbeaten when he makes his 2018 debut on April 21. The 25-year-old from Santa Fe, Argentina most recently defeated former interim champion Johan Perez by unanimous decision last November in his first fight to go 10 rounds. In Rocky Graziano: Fists, Fame, and Fortune (published March 10 by Rowman & Littlefied), Jeffrey Sussman tells the rags-to-riches story of Tommy Rocco Barbella, who came to be known as Rocky Graziano. Raised by an abusive father, Graziano took to the streets and soon found himself in reformatories and prison cells. Drafted into the U.S. Army, Graziano went AWOL but was eventually caught, tried, and sent to prison for a year. After his release, Rocky went on to have one successful boxing match after another and quickly ascended up the pyramid of professional boxing. In one of the bloodiest battles in the history of the middleweight division, Rocky beat Tony Zale and became the middleweight champion of the world. Rocky retired from boxing after he lost his crown to Sugar Ray Robinson and went on to have a successful acting career in two acclaimed television series. Rich and famous, he was no longer the angry young man he once was. In his post-boxing life, Rocky became known for his good humor, witty remarks, and kindness and generosity to those in need. Rocky Graziano’s life is not only inspiring, it is also a story of redemption, of how boxing became the vehicle for saving a young man from a life of anger and crime and leading him into a life of happiness and honesty. The first biography of Graziano in over 60 years, this book will bring his story to a new generation of boxing fans and sports historians.